Do you like airy and spongy cakes that have a tender crumb? 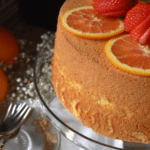 If you do, this Perfect Light Fluffy Orange Chiffon Cake Recipe is for you! 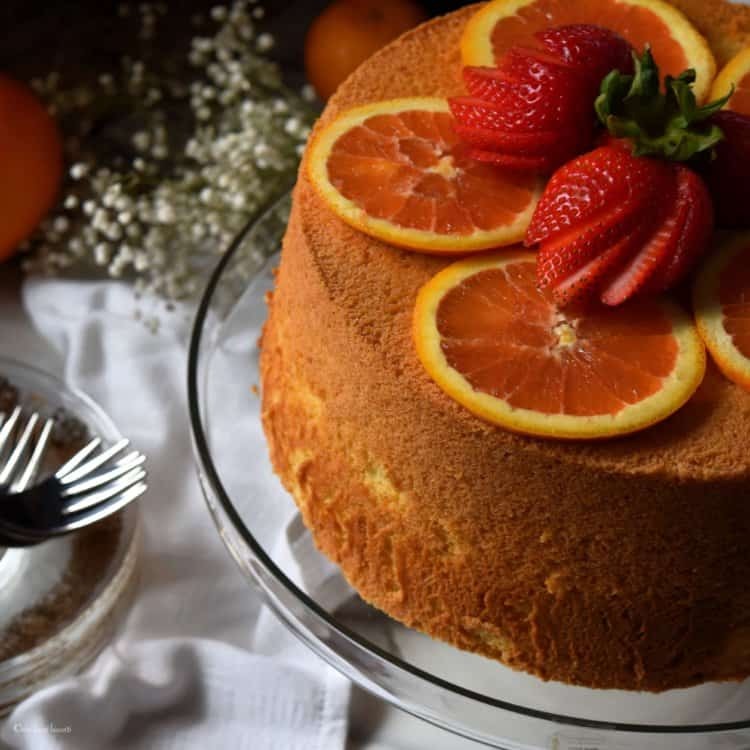 Let me show you how easily this can be achieved every single time you make this orange chiffon cake. 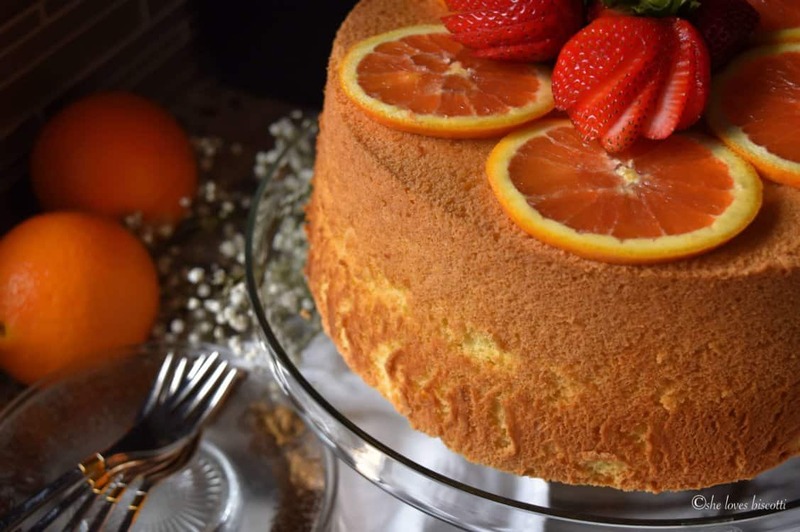 The right temperature: Temperature plays a crucial part to the overall success of your chiffon cake. Make sure your ingredients are all at room temperature, and yes, this includes the eggs. Equally important is the oven temperature. 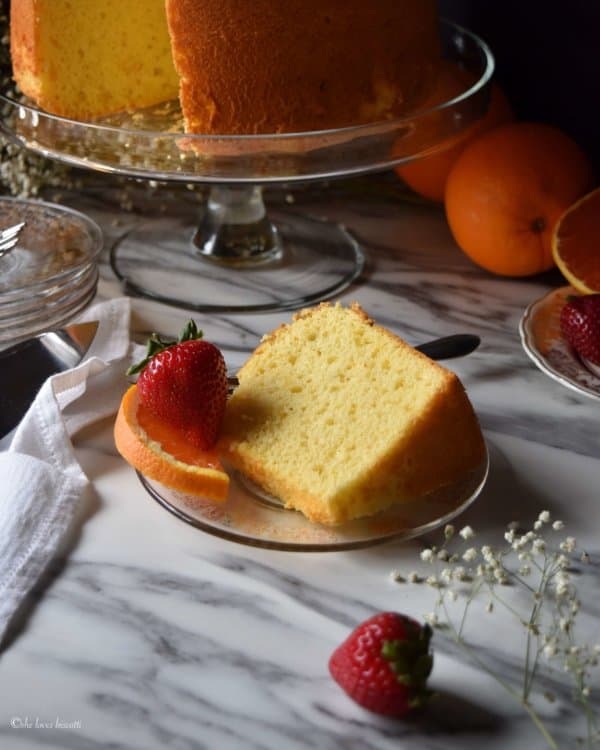 The right temperature is essential if we want our chiffon cake to rise to its maximal height. From my personal experience, the perfect oven temperature (in my oven) to bake any chiffon cake is 325° F (165°C). I would also like to mention that when I set my oven at the proper temperature, I will place my oven grates in the bottom third of the oven. The right equipment: I obtain the best results when I bake my chiffon cake in a two-piece chiffon tube pan. DO NOT use a non-stick pan and please DO NOT grease the pan. As the cake is baking, it will cling to the straight sides and rise to the top! By greasing the pan or using a non-stick pan, the cake will never achieve those heights. Have you noticed that some chiffon cake pans have a set of three side legs? These legs create space between the top of the cake and the surface of the cooling rack. After the cake is removed from the oven, invert the pan on a cooling rack and allow to cool down completely before removing the chiffon cake from the pan. The ingredients: By using cake flour and extra fine sugar (castor sugar), the texture of the final product is more refined. That being said, you can still get fantastic results with regular granulated sugar and/or all purpose flour. A word of caution: Ensure there is no trace of egg yolks in the egg whites when separating the these two liquids. Any trace of fat will affect the ability of the egg whites to whip up into firm and glossy peaks. This also applies to the mixing bowl and the beaters. Make sure everything is squeaky clean. I would also like to mention that when you are whipping up those egg whites, we do not want them to reach the stiff peaks stage as this will affect the overall stability of the cake. The same is true for under whipped egg whites. The egg whites need to curl ever so lightly when removing and holding up the whisk. The combination: Gently fold the egg whites in the batter in 4-5 additions. Do not over mix. In order to remove as many air bubbles as possible, gently tap the bowl on the kitchen counter a couple of times. You will notice air bubbles bursting. The transfer: Gently pour the batter in a 10 inch (25 cm) ungreased tube pan. If possible, get as close as possible to the pan when pouring the batter. Gently run a knife through the batter to dislodge any other air bubbles. The baking: Bake in a 325℉ (165°C) oven for 55-60 minutes or until cake tester comes out dry and the top of the cake springs back when lightly touched. Once you remove the cake from oven, invert on wire rack and allow to cool completely in the chiffon pan before un-molding. When ready, run a sharp knife around the edges to help loosen and release the cake. Et voilà! 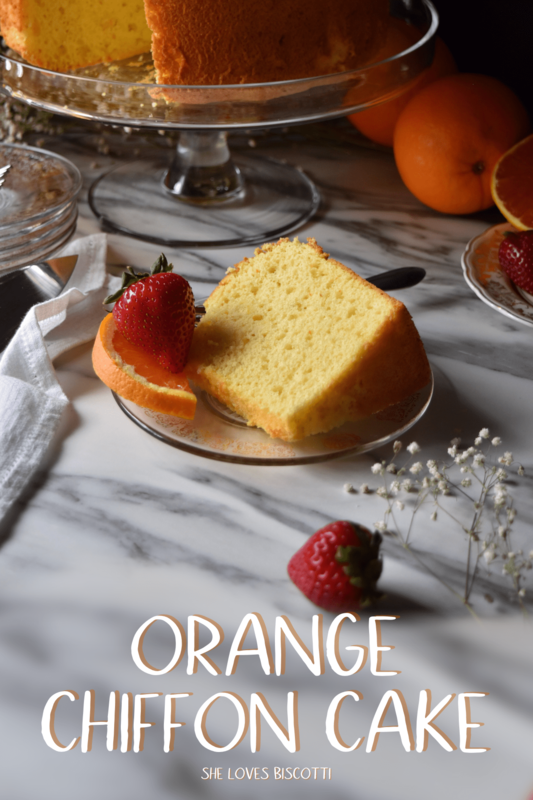 You have just made the best orange cake recipe in the world! You can serve it with a wonderful coulis de fruits (fruit sauce), some fresh fruit or even some Simple Macerated Strawberries. (My daughter introduced me to this band a few years ago and I just love them). My thoughts wander, as they often do, and I think of my mom. I initially started this journey of having a “food blog” to document and honor my mom’s recipes. As food played such a big part of my upbringing, it’s no wonder I became a dietitian. 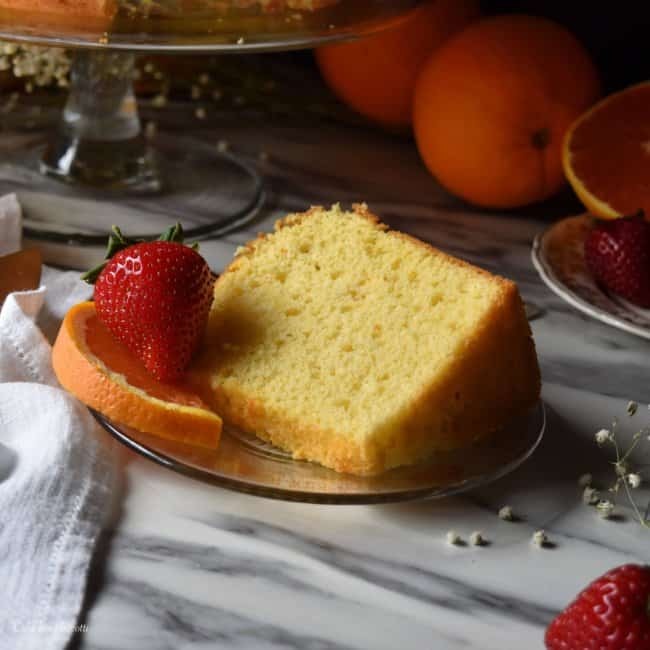 My mom would often make an orange chiffon cake for our Sunday dessert (in fact, she would alternate between her Italian Cake and this chiffon cake). Unfortunately, she would make it from memory and so there was no need to write it down. To the best of my recollection, the orange chiffon cake recipe from Martha Stewart resembles the way I remember this cake tasting. I can’t help but smile when I think of this fluffy cake recipe. It brings me back to the Sunday lunch ritual… the endless array of pots on the stove and in the sink; my younger brother, dipping a chunk of Italian crusty bread in the ragu; my grandmother, sitting in her usual spot; and my mom, literally a one woman show, doing it all and at the same time, being omnipresent and supporting the whole lot of us- a smile, a hug, a word of encouragement… always present in the moment, always loving. Forever grateful and always in my thoughts. Preheat the oven to 325℉ (165°C) . Place oven grates in the bottom third of the oven. In a medium bowl, sift together flour, baking powder, salt and only 1 cup of sugar. Make a well in this dry mixture and set aside. In another small bowl, mix together the oil, orange zest, juice and egg yolks. Add this wet mixture in the well of the dry mixture and whisk until combined. Set aside. In a large mixing bowl (of stand mixer) beat the egg whites on medium speed until foamy; increase speed and continue to beat until soft peaks form. Gradually add the remaining 1/2 cup of sugar, 1 tablespoon at a time until you get firm, glossy peaks (when removing the whisk, the tips should hold but curl over). Fold the egg whites in the batter in 3-4 additions. Gently pour the batter in a 10 inch (25 cm) ungreased tube pan. Bake in a 325℉ (165°C) oven for 55-60 minutes or until cake tester comes out dry and the top of the cake springs back when lightly touched. Remove from oven, invert on wire rack and allow to cool completely in the chiffon pan before un-molding. Run a sharp knife around the edges to help loosen and release the cake. Special equipment: 10 inch (25 cm) tube pan. First you say it must be non-stick, but then you say using a non-stick pan the cake will not rise. Which is it? The problem I had with this cake was that it got stuck in the pan, it also broken into 2 pieces. The cake had a nice flavor to it. I’m sorry to hear this Lina. I do have a few questions as this might reveal why the recipe did not turn out. Was a chiffon cake pan used? Another possible cause is the oven temperature as there are often fluctuations between the actual temperature and the number on the dial. Did the cake have a dry texture? I appreciate you taking the time and sharing your experience with this cake. Cake had great flavor and looked pretty, but was on the dry side. Any ideas what happened? Tried this recipe for the first time. Reduced the sugar by 1/2. Mum says still sweet. Successful nevertheless! Thanks. 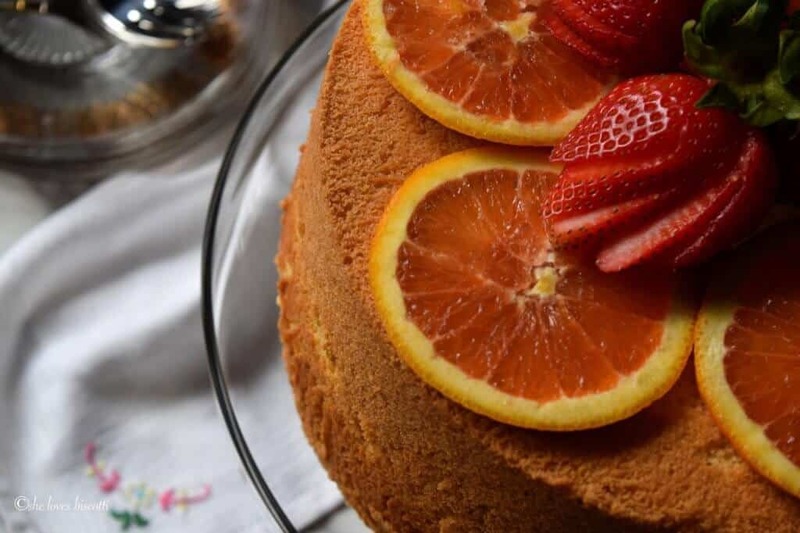 – Make it a lemon chiffon cake, hence I will use lemon juice and zest. – Bake it in round pans to make a layered cake. What a perfect looking crumb, I would love to make this cake! This was certainly a very informative 101 on making this particular type of cake. Once again, this has not made it in my repertoire…however, I did make it a point to place yours in file for when I do decide to tackle this one. Maria, your cake turned out stunning. Your Mamma is surely proud of you from the paradise above us. I made it. And it’s good.Although it’s nice and fluffy I still prefer it with butter not oil. Sooo fluffy, Im gonna die! 🙂 thank you, superb recipe! Thanks Viktor! Have a great weekend!